They played dodgeball every day, all of them, with their distinctive styles. There was Danny, who ran up to the line and heaved the ball as hard as he could; Peter, who ran around in the back and hurled the ball as hard as he could; Ben, who liked to taunt his opponents and try to catch the ball when they threw it so that they would be out. Marianne liked to deflect incoming shots with the ball in her hands, then return fire while the enemy was looking for more ammunition, while Mary-Ann would pause close to the line to draw attention, then run. TJ and Janet, who were good friends outside of the game, always managed to end up on opposite sides and would try to tag each other out as quickly as possible, ignoring all other players until this goal was accomplished. Ed took things easy, holding onto a ball in the back for minutes at a time, then lining up a shot and throwing in a precise arc. He never missed, when he got around to throwing, although he was rarely the last one left on the field. Travis would make a show of palming a ball in each hand like a basketball player and double-throwing. Rachel and Alexia, who were twins and took gymnastics lessons, had the respect of all the other players for being able to catch a ball in one hand, and were good dodgers. That made eleven, an odd number, and they were always on the lookout for another player to round out the teams. So when Robbie joined, they were glad to have him—until the problem became plain. Robbie had been trained as a ninja, he said, since the age of five, and after half a dozen bouts in a row in which his team won quickly, handicaps were devised to preserve the game. The first thing they did was put TJ and Janet on the team opposing Robbie, so that they had to work together against him. Then they put Rachel and Alexia on that team as well. When he still won, they started weighting the teams against him, until finally everybody was lined up on one side against Robbie on the other; a swarming multitude against one lone player. In these games, Ed became even more of a shadow, hanging in the back and barely taking part, so infrequent were his throws, and even Travis, the boldest of them all, became more cautious. It was a wonder to see Robbie play. Fast, surefooted, unerring, he could change directions unexpectedly and hit most of his targets without even looking. He had some strange moves as well. His favorite was to drop out of the path of a throw and roll or tumble to the nearest ball, then come up out of the roll and throw. He could jump a couple feet straight up when someone targeted his shins, and he could catch anything aimed above that. During the first two games, the others found themselves too crowded, overwhelmed by their own numbers, and lost quickly. After that they began to organize and plan, and as they grew more sophisticated, Robbie had more trouble winning. Finally, he lost a game. One of the strategies they had developed was to have the best blockers and catchers in the midfield, reducing their losses, until everybody had a ball, then to throw together in volleys. Robbie had to keep moving to avoid their throws, or crouch and block. This was when they discovered that he could catch with one hand, then pass the ball to the other hand and throw while catching again. TJ and Janet timed a pair of shots accordingly, so that TJ threw just after Robbie had caught Janet’s throw but before the transfer could be made. Robbie caught the second ball in his off-hand, and smiled. It was a proud smile, as might be expected for such a feat, but also eerie. None of them had ever seen him smile before—his eyes were always focused in an intense, serious gaze. Then, as if to top the catch, he threw both balls at once, outing Travis and Ben. But, even as his body whipped back, recovering from the throw, Ed’s ball came down out of a high arc and bounced gently off the top of Robbie’s head. It was such a shock that everything simply stopped for a moment. Robbie stumbled and stood, head turned away, watching the ball roll into the back of the playing field. Everybody else froze and watched him. Finally, when the ball had come to rest, he turned back with a tiny, rueful smile on his face—less unsettling than the first—shook all their hands, and left. “Robbie caught the second ball in his off-hand, and smiled.” Illustration by Ryan Armand. When they met for the next game, the mood had changed. Everybody was serious now, grim or determined according to their preferences: tense. They wanted to win again. Robbie, on the other side, was darkly inscrutable. They began playing. The blockers and catchers lined up, and Robbie began sniping at them with implacable precision, taking two out before the ammunition for the first volley was gathered. When it did come, he was ready. At the first twitch of a thrower’s shoulder, he leapt to the side, then back again as his opponents adjusted their aim. Then, with the second volley being loosed, he jumped into a back somersault—picking up a ball with his feet and flipping it up into Danny’s chest so that he staggered back and sat down with a bump, although more out of surprise than from the force of the blow. Then, with the first-volley throwers rearming and the third volley in the air, Robbie rebounded off of the ground, took a few quick steps, and launched himself into the air with a powerful twist like a high-jumper. There he spun, seeming to hang horizontally while the balls thrown at him bounced and pattered below, and a ball somehow flew from his hands toward Peter, who stared at it in amazement as it ricocheted off of his belly—and then Ed’s ball moved in a straight line from his hand to Robbie’s side, and bounced off into the background. Everybody else watched it go, wide-eyed. Robbie landed in a crouch, one hand splayed out in front of him, the other tucked behind his back. Nobody moved while he and Ed stared each other down across the playing field. Soon, though, Robbie’s eyes narrowed, and both of them turned and ran, as one, off of the playing field and vanished from sight. None of the others saw Ed or Robbie again. Ed had been training as a ninja since he was three, after all, and while Marianne guessed that they were from rival clans and had run off to fight or hide, it was just a guess, and never confirmed or refuted. That was fine, though—there was an even number now, and Ed had never really played very hard anyway. The game went on. This entry was posted in Short Fiction and tagged dodgeball, ninja, playground, Robbie. Bookmark the permalink. Great story, although the ending confused me a bit. 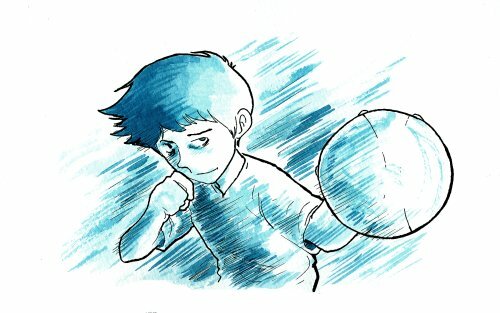 In the last game, Ed’s ball hits Robbie, and then after a mutual staredown both run away, right? This seems like a similar situation to the first game where Robbie lost, and if so why didn’t Robbie run away then? And why did Ed run away if he lost? Ah, the implication is that Ed has been keeping his ninja training semi-secret (or at least low-key) – which is why he participated slowly rather than making a show like Robbie does – and when they stare at each other, that’s the moment when Robbie realizes, and Ed sees that he realizes, and Robbie sees that, and so on. Now that I think about it, it might work a little better if I switch their ages.